Choosing the right kind of kitchen faucet can be tricky. There are multiple brands, styles, prices, and materials for you to select from. In today’s post, we’ll look at the top faucet brands – from Moen to Kohler to Delta kitchen faucets. We hope today’s post we’ll help you pick the right kind to choose in your home. Ideally, we want a bathroom space that reflects our personal taste and style. At the same time, we want a bathroom that can provide all the comfort we need. Moreover, it’s also essential to find the right bathroom amenities and fixtures that deliver value, function, and attractiveness. Thus, when it comes to bathroom remodeling, picking the proper design with careful planning should be your priority. If you want to make the bathroom of your dreams a reality, follow the tips we have prepared for you today. Before you even get in touch with a bathroom remodeling company, you should first discuss the would-be changes and renovations with everyone who will be using the bathroom space. Talk with family members and see what their opinions are on certain finishes and fixtures. Most importantly, discuss what your budget is; unexpected problems may occur that will increase the cost, and you want to make sure you will have those covered. Planning would go a long way when it comes to your bathroom renovation plans, especially as you move along with the renovation project. Once the renovation has begun, expect the project to take anywhere between 30 and 90 days, maybe even more. No matter how long it would take, avoid changing your initial plans and budget stipulations – unless serious issues or financial constraints should arise. Changing your plans during the renovation will have you unwillingly shell out more money and extend the completion date, which would be significant drawbacks. If you’re having a challenging time planning your bathroom remodel, speak with a professional remodeling contractor and get their expert advice. He or she can handle the scheduling and coordinating for all the vendors and installers involved in the project. A professional can also guide you in setting the right bathroom remodeling vision that will suit your style and needs. A typical bathroom comes with a toilet, a sink, and a bathtub. Many have optional extras such as a shower area and a bidet. 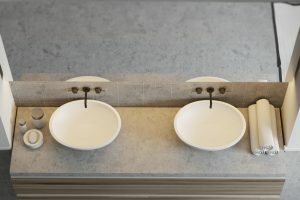 Double sinks are also getting more popular among homeowners, especially in master bathrooms where the sinks are often used by a couple. A customized bathroom is filled with several suite fixtures – similar to a typical bathroom. Customized and standard bathrooms differ in the final, completed design. A customized bathroom’s final design will usually be completed with several built-in cabinets around the room and matching countertop. To maximize savings during your bathroom remodeling or demolition project, it’s highly advisable to have the new bathroom plumbing fixtures near the existing plumbing. However, if your bathroom remodeller sees old plumbing or outdated wiring, then it’s their professional discretion to tell you to gut out the old wires and pipes and install new ones. This feat may add to the cost, but your safety is priceless; outdated plumbing and wiring will only mean further damage down the road. 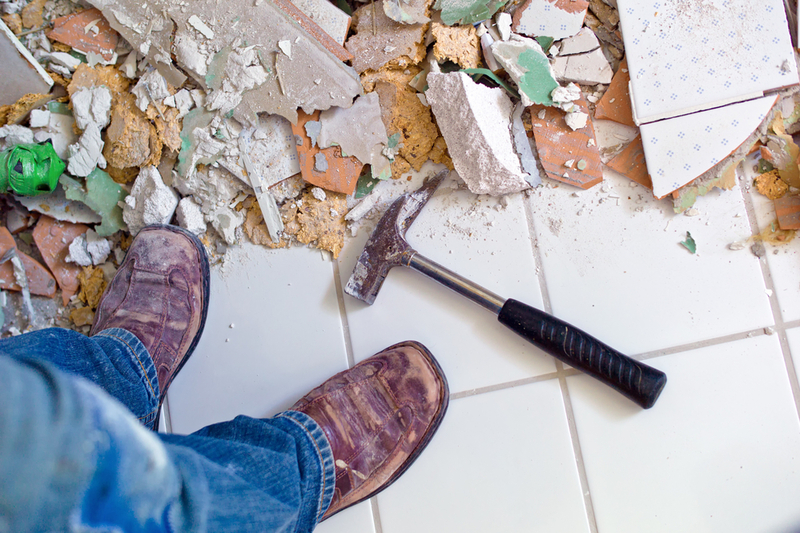 If your remodeling project is limited and you need to keep the existing footprint, try not to worry too much. There are tips and strategies to give the impression of a bigger space. For example, make use of pedestal sinks. These sinks are a popular pick in small bathroom spaces as they can make the area look more spacious. Also, clear glass shower doors are a better pick than shower curtains. The latter blocks natural light coming in, making the space look more dim and enclosed. Likewise, instead of a medicine cabinet mirror, opt for a big mirror. A big mirror will give the illusion of a bigger space. Although elegant water fixtures would add elegance and timelessness to your bathroom, luxurious and sufficient bathroom lighting would definitely elevate your space to new heights. Additionally, a well-designed vanity lighting will help eliminate shadows on your face as you get ready. Combining LED recessed lighting with elegant wall sconces by the bathroom mirror is a great lighting idea. When it gets too bright, you can always opt for dimmer switches. Moreover, overhead and perimeter lightings are very important for the bathroom. During a bathroom remodeling project, it’s a common mistake to overlook ventilation solutions. What homeowners are not aware of is that adequate ventilation is absolutely vital, especially in ensuring the bathroom renovation project lasts for many years. A bathroom without proper ventilation is a good place for mold and mildew to grow, which could damage the upgrades you installed during the remodel. A high-quality fan will provide good indoor air quality and prevent the growth of mold and mildew, so make sure you include a bathroom fan in your remodeling plans.